Located at basement, we’ll be having a massive UV party to raise money for our brilliant scheme. We’ll have plenty going on throughout the night, including beer pong and some of our very own University of Leicester DJs! A big thank you to everybody who supported us during our Crowd Funder campaign to raise funds for vital life-saving equipment. In just 21 days we managed to fund-raise an astonishing £4,155! We are extremely grateful for all donations that we receive, regardless of their size. If you are interested in what we raise funds for, or would like to donate, please see our donation page. To view some of our highest donors, please see our supporting donors page. 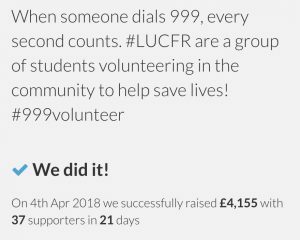 #LUCFR have now responded to over 100 calls! Thank you to all of our supporters and responders. Below is an infographic showing some of our statistics for the first 100 calls. If you would like to learn more about our call types, please see our statistics page. “It was my first shift, Aradyha’s second, we had been waiting for an hour for a call out. Suddenly the siren sounded from our phone, we had been called to an incident. We grabbed our bags and rushed to the car. We had been told it was a head trauma, priority purple, just down the road. Navigating the one-way systems of Leicester, while talking through how we should approach the patient, was tough. Adrenaline was flooding our bodies. We arrived outside the incident, where an ambulance had already arrived, but there was no space for us to park. I jumped out to join the ambulance crew, while Aradyha parked up. I walked in to see around 100 people crowding round the patient, who was lying on the ground, and two paramedics midway through chest compressions. I leapt to their side, introduced myself to the closest of the two and explained that I was a First Responder. I was met with relief and was asked to take over with the compressions on the chest. I have practiced CPR on mannequins many times with other volunteer agencies, lifeguard training and at medical school, but this was the real thing and I felt a lot of pressure. This was a real person. A human-being, in need of help. Help that that I can provide. I placed my hands on the chest and commenced compressions. I was counting out loud up to 30, but the ‘teens seemed to pass so quickly…time wasn’t working properly. I stopped as the paramedic squeezed the bag of air to fill our patient’s lungs…twice…I continued with 30 more compressions on the chest. I felt some of his ribs crack. I had been told numerous times that this was perfectly normal, and even a sign that it’s being done properly, but it still unnerved me. I almost wanted to stop. But I remembered my training. I continued. A few cycles of more compressions and breaths later Aradyha arrived and took over from me; swapping over every few minutes. After around 20 minutes, during which another ambulance crew arrived, we managed to get a pulse. We had got a return of a heart beat! The patient was quickly moved onto a stretcher and whisked off to hospital. We are very pleased to say that all of our students have now completed their first responder training and can therefore begin responding to 999 calls within our community! The enthusiasm of all students throughout their training has been infectious and they have been able to build new relationships with one another, which will help strengthen the teamwork they will rely upon when treating patients. Cohort 2 Training is Nearly Complete! Half of our students from cohort 2 have today completed their assessments, meaning they are able to join the rest of our team as operational responders. The remaining students in the cohort have their corporate induction to complete, which covers essential areas such as safeguarding, infection control, communicating with the control room and a range of other vital information. All of our volunteers are very enthusiastic and cannot wait to get out into the community! We are now operational and have responded to our first emergency call outs, in fact, we have already reached double figures in the number of activations we have received from the EMAS Control Room, check our our statistics page! Our responders are working hard to improve response times and outcomes for people in our local community. Our responders are dispatched to an emergency call at the same time as an emergency ambulance, but as we are often a lot closer to the incident we are able to be by the patients side much sooner. Cohort 1 Training is Complete! Cohort 1 of #LUCFR have completed their training and have begun their assessments! Once our responders have completed their assessments they will be able to log on with EMAS to respond to calls. 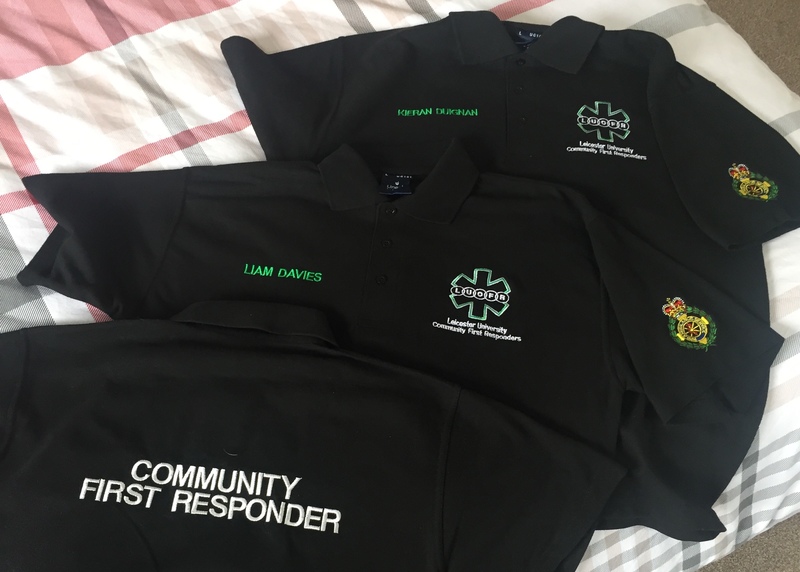 © 2019 Leicester University Community First Responders.